So exactly how Fascist is Australia – on a scale of One to ‘Hitler would be Proud’? Fascism and communism may be at different ends of the political spectrum. But they look a lot alike in practice – at least to me. Both result in a dramatic loss of freedom for their populations and a massive increase in power to those in government – the state. This is because as you move to the extreme end of left or right (communism or fascism), the government’s rights and objectives become more important than those of the average punter that it governs. 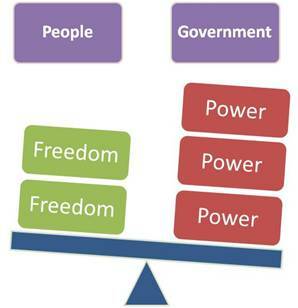 And for the government to achieve its goals, the balance of power that exists between the individual and the state has to shift heavily in favour of the state. However, whenever you give a government more power, that comes at a significant cost to its people. And that cost is paid not in taxes, but in ‘personal freedoms’. Or put another way, the more power-hungry the government, the more personal freedoms that needs to be sacrificed to it, in order for it to survive. So is Australia a Fascist State? Well clearly it isn’t. Unless I slept through a coup, we all still have the right to vote, the right to tweet, the right to speak our mind, the right to sit in a #QandA audience – at least most of us do. In other words, we all still have many of the freedoms that populations of other less democratic countries around the world – like Egypt – covet. BUT…..there’s no doubt that since the Abbott government took power, there has been a reduction in personal freedoms, and an increase in government power. And whilst we are nowhere near being a Fascist state like Nazi Germany right now – and hopefully never will be – these things typically don’t happen overnight. Instead, they happen bit by bit. 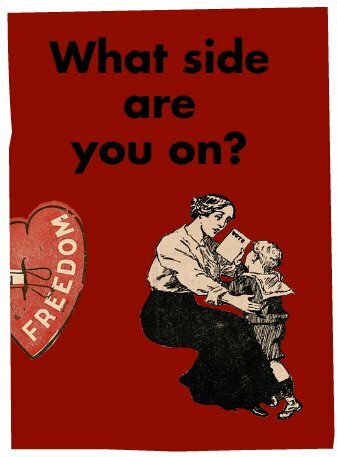 And with each ‘little’ personal freedom we give up – whether it’s the right to report abuse in a detention center, or the right to access whatever internet site we want to – we shift the scales in favour of the state, and give up our individual rights. So let’s have a look at each of these, and see how we’re tracking against each of them. We don’t really call it propaganda anymore – we call it ‘spin’ or ‘truthiness’. And the difference between truth and propaganda (or truthiness), is that the later ignore pesky things like facts, evidence or logic. 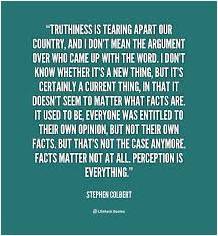 All truthiness requires is a general ‘feel’ of ‘truth’, not actual truth, making it much easier for politicians to work with. Here’s some of the ways our politicians are replacing truth with truthiness. In a world where you were using ‘truth’ as your yardstick, it would be difficult to reconcile these seemingly contradictory statements. But when you’re using truthiness as your guide, it’s no problem at all. They repeat. Repeat. Repeat…….and repeat again….and again…..
“It would not be impossible to prove with sufficient repetition …..
Jedi of Truthiness – Tony Abbott – has done this to great effect with his “Stop the Boats” or “We’ve stopped the boats” mantra. As a piece of propaganda – it’s perfect. Firstly, it’s short and easy for people to remember. And secondly, it’s completely ambiguous. It never actually says what the boats are supposed to have stopped doing. This means it can be interpreted in any number of different ways, depending on Abbott’s needs at the time. He uses the fact that boats have mostly stopped arriving in Aus, to infer that asylum seeker drownings have stopped, that thousands of asylum seekers are safer, that the government’s asylum seeker policies are compassionate and that people smuggling has stopped. The key to a good desensitisation campaign is to do the thing you are trying to desensitise people to – in this case, lies – as often as you can. The more you lie, the more people will stop expecting the truth from you, and the less outraged they will be when you tell a big one. In Aus, this is hardly a new phenomenon. Politicians over the years have paved the way for those that follow in their footsteps to lie with impunity. This has worked in Abbott’s favour, particularly given the huge number of promises he made to Australians prior to the last election. Promises which, quite frankly, nobody who knew much about anything thought he could really keep. As a result, since being elected, when you compare the number of promises Abbott has kept to those that he has broken, it’s just over 50% (and that’s arguably overstated because the ABC Promise Tracker is being generous). This too is hardly news. Question avoidance is expected of politicians. Media training teaches them to ignore any difficult questions and instead to respond with an answer that’s broadly in the general area of the question and which suits their particular brand of truthiness. Tony Abbott is a master at question avoidance. For example, recently when he was repeatedly asked whether the Australian government had paid people smugglers to take asylum seekers back to Indonesia, he just kept repeating that the important thing was that they had Stopped the Boats. Stopped the Boats. Stopped the Boats. He kept repeating this, and it didn’t take long before journalists gave up, and he had both buried what could have been a very inconvenient story and promoted his own message. Classifying key information as an ‘operational’ or a ‘security matter’ – A whole swag of truths have been locked up this way – never to see the light of day – particularly those around ‘Stopping the Boats’. Threatening to lock up whistle blowers who reveal problems – this started in 2014 with the passing of legislation allowing the government to jail both whistleblowers and journalists (for five to ten years) for exposing errors made by Australian security agencies. More recently, in 2015, the recently passed Border Force Protection Act prohibits medicos from reporting sexual and other forms of abuse, as well as Navy and Customers staff from telling us if asylum seekers die at sea. Effectively hobbling Freedom of Information – this started shortly after the Abbott Government’s election, when they tightened Freedom of Information procedures, to make it more difficult to request and obtain information. They then starved the Freedom of Information office of funds, so that staff resigned and the Commissioner was left working out of his house. He too finally gave up a few weeks back and resigned. Eliminating Government agencies that provide factual information which may contradict their policy positions – this is particularly true of climate change, where the Climate Council was defunded, and the Climate Change Authority came under attack, but was eventually saved in the Senate. In the meantime, apparently there are sufficient funds for a Wind Commissioner. Controlling Internet Content – this may turn out to be nothing, but the recently passed Copyright Amendment Online Infringement Bill could allow the government to restrict what content we see. While the Bill’s stated goal is to stop the pirating of videos, the actual language in the Bill could allow a court to block distribution of anything that is protected by copyright – Wikileaks for example. 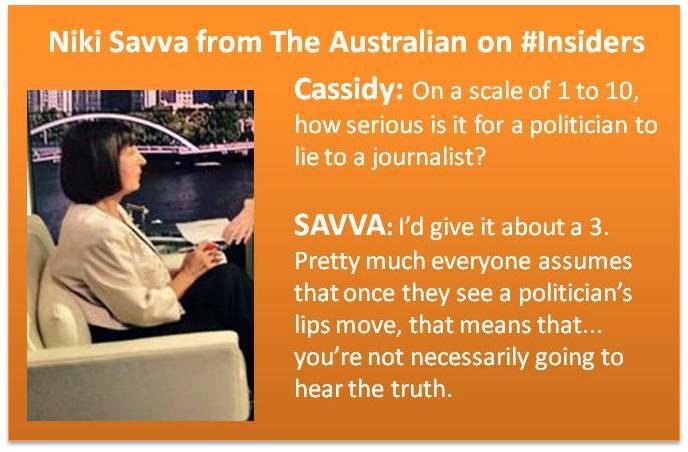 Discrediting those that speak the truth – there are a few examples of this, but probably the most prominent is the attack on Human Rights Commissioner – Gillian Triggs. The extent of the attacks on her – as a reputable international lawyer – is incomprehensible. They are at best bullying, and at worst a shameless attempt to influence an independent commission. Distorting the truth to suit their needs – most recently this happened when the Abbott Government claimed that their proposal to allow the Government to bypass the judicial system and strip citizenship from people, was “precisely what was recommended by the former independent national security monitor Bret Walker” when in fact it was the exact opposite, and he had misquoted Walker out of context. When looked at as a whole, these actions may not be sufficient to confirm a conspiracy by the Abbott government to keep the truth from the Australian public, but they certainly suggest a pattern of devaluing the truth, and an intention to control what information the Australian public does and does not see in service of their own political needs. They certainly do NOT suggest a government committed to transparency and accountability. Instituting a climate of fear was a key part of the Nazi’s propaganda program, as when people are in a heightened state of anxiety, they are more emotional, and less likely to think for themselves. The Nazis focused a lot of their propaganda one particular religion – Judaism – presenting the Jews as a risk to the German way of life. The Abbott Government gets full marks for this one. 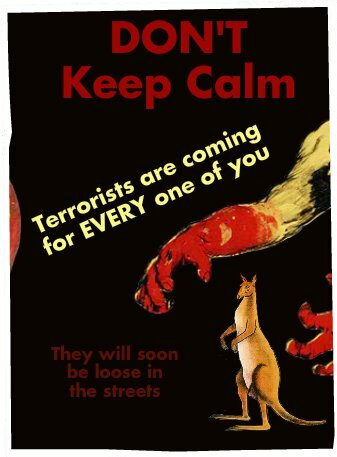 They have managed to convince a majority of Australians that a terrorist attack poses the greatest risk to their safety both from within and outside Australia. This is despite all evidence to the contrary. Evidence that shows that Australians are more at risk from falling out bed or off a chair than they are of being killed by a terrorist, even allowing for foiled attacks. Abbott has even linked stopping the boats with terrorism – completely ignoring the fact that asylum seekers are typically victims of terrorism rather than perpetrators of it. And as a previous chief of ASIO pointed out, if you are a potential terrorist seeking to attack Australia, the very worst way to enter the country would be as an asylum seeker. Any asylum seekers that do make it onshore are locked up for years and undergo the strictest possible security checks prior to being released into the country. And yet Abbott, this week, in a speech to Border Force personnel described them as “guardians of our safety, security and prosperity“. This too was another one of the Nazi’s key tools. Nazi propaganda “cast Germany as a victim or potential victim of foreign aggressors, as a peace-loving nation forced to take up arms to protect its populace or defend European civilization against Communism”. They overplayed and even staged attacks against the country so that people within the country felt under attack, and believed that the needed to go to war to protect their country. Appealing to patriotism has been a key tool in the Abbott government’s arsenal since day one. 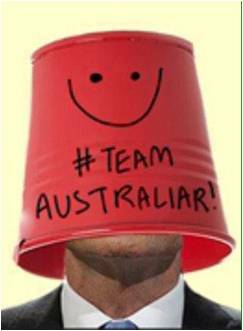 Abbott introduced the concept of “Team Australia” – implying a concept of ‘us’ and ‘them’ – where those he considers to be a ‘them’ being seen as UnAustralian and a risk to the country. Most recently, the government has introduced the patriotically named Allegiance to Australia Bill to parliament. This is the Bill they are seeking to use in order to strip citizenship from dual nationals (and potentially others) – allowing them to effectively banish people from the country. And they are invoking patriotism to suggest that anyone who objects to the Bill is Unaustralian and dangerous, silencing any major opposition. So how Fascist is Australia then? “Secrecy is completely inadequate for democracy, but totally appropriate for tyranny”. Conclusion: Be alert and alarmed. Abbott & Co’s apparent disdain for the truth in favour of truthiness, the way in which they are undermining our personal freedoms by restricting our access to the truth, their almost ludicrous and self-serving focus on terrorism and their constant invocation of patriotism to support their viewpoint is concerning. 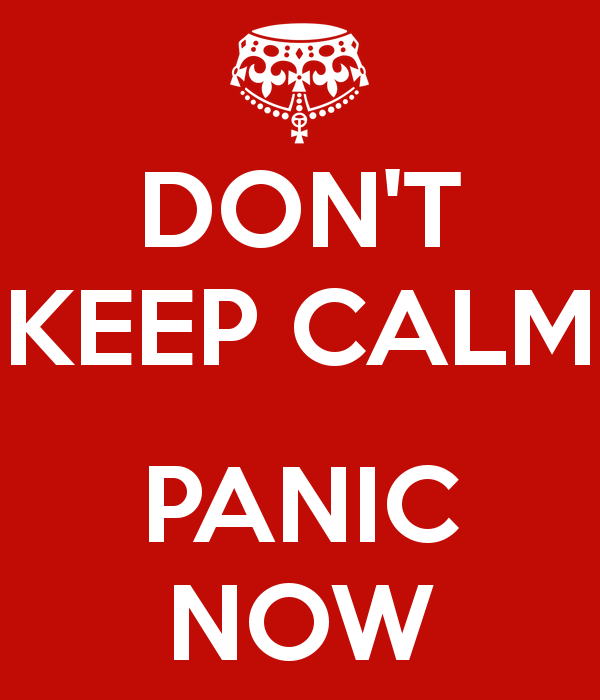 When you then take into account the fact that the proposed Allegiance to Australia Bill seeks to bypass the judicial system and vest power to revoke citizenship in the Minister for Immigration, without the right for judicial review – we really should be both alert and alarmed. This is not because Australia has become a fascist state, but because this continual chipping away at our personal freedoms in favour of government power sets up an environment to allow extreme ideologies to flourish. The rise of movements like the right-wing ‘Reclaim Australia’ movement are key examples of this. The real battles we should be fighting and winning right now are not against an enemy who is 11,000 kms away – they are the ones here at home that are weakening our democracy. And that is a far greater risk to our way of life than any terrorist army on the other side of the world. What democracy, when are the media going to look at the underlying problem. We have two political parties that can take power and none of the members of those parties are selected by us. Basically we are an oligarchy not a democracy. When you look into that problem you find a political scene in which the politicians have to vote along party lines (or else) and they are selected ONLY if the do vote that way. Party lines are drawn up by people who are not voted in and server the interests of a few rather rich people. Only when this becomes common knowledge and we go back to having more political parties can our freedoms be restored and our country start to become great again for all Australian’s. I was pretty pleased to uncover this site. I want to to thank you for your time due to this fantastic read!! I definitely liked every bit of it and i also have you book marked to check out new information on your site. Every time the LNP bully boys fall flat they look for someone else to blame and go after them. They are utterly without insight, conscience or shame. This was amply demonstrated by their appalling attacks on the Human Rights Commission and Gillian Trigg. Is it ok to characterise some current right wing parties as having Fascist attributes? YES! And the LNP is one of them. We are seeing a worldwide resurgence of Fascism. Only this time its not Corporatism, run by the state, it is Corpocracy; with the state run by corporations. An authoritarian and nationalistic right-wing system of government and social organisation”. From Italian fascismo, from fascio ‘bundle, political group’, from Latin fascis. Fascism as based on the tight bundling together of corporate and state power with the estates of law, church, the media and social organisations. Fascism is a romantic reaction against The Enlightenment and Democracy. It is disgusted by notions of “Liberty, Equality, Fraternity”. Fascism is ant-humanitarian, fearful of social progress and disdainful of the scientific methods of understanding the world. It is essentially chauvanistic, sexist, elitist, overtly homophobic and irrational. In identifying all that is good with a tribal “us” Fascism lends itself to scapegoating and dehumanisation. It tends to blame all societal problems on “them,” and presupposes a conspiracy of cosmopolitan and intellectual evildoers which emasculates and humiliates the idealised racial core group of the nation. To solve society’s problems one need only unmask the conspirators and eliminate them.